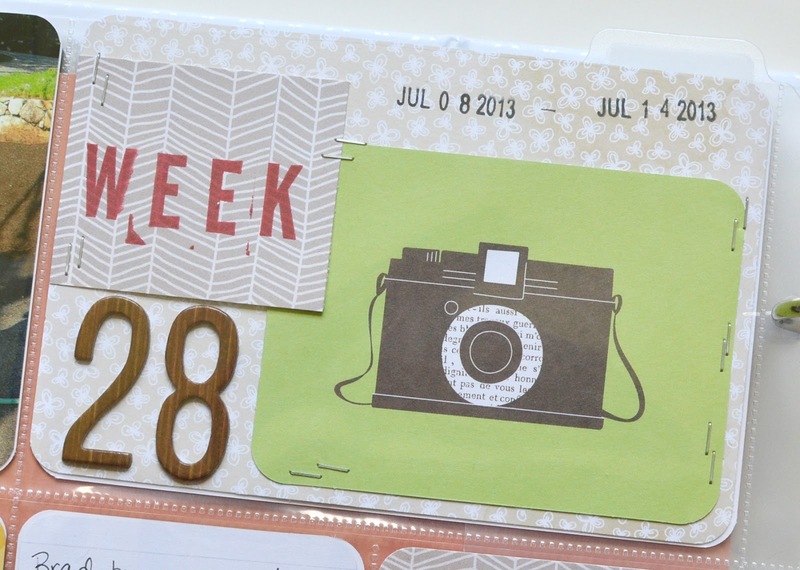 Welcome to Project Life 2013, week 28. This week nothing special went on, so to spice things up a little I went with a bright and bold color palette and some fun patterned papers. My photos of Austin on the playground were all very bright blue, and I had a hard time finding journaling cards that coordinated in all of the Project Life kits I have. So I found a sheet of heart patterned paper that had blue and yellow hearts in the Amy Tangerine Sketchbook 6x6 paper stack and started there. On this page I used a few sheets of paper from that Sketchbook pad, along with paper from the Studio Calico Abroad collection 6x6 paper stack. 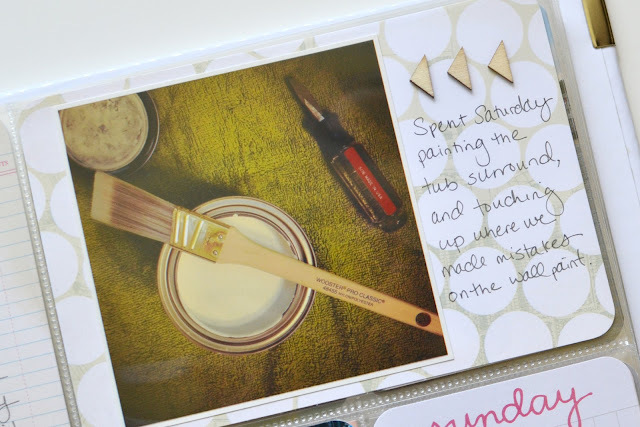 The journaling cards I used are from the Blush kit, I believe. My title card used a camera card from the Dear Lizzy HSN mini kit and my new favorite alpha stamps, Amy Tangerine Document. I really like how they look when they aren't perfectly aligned and when they have a little bit of ink from the edges of the stamp. Just kind of messy. I don't know why, but I love it. And the thickers are American Crafts Patchwork. As you can probably read in the photo below, Brad buys Austin's pull ups at Target. Usually, they have a deal where you receive a Target gift card (kind of like an instant rebate) when you buy multiple boxes. About a month ago he got this wood veneer one and I insisted that he ask for it back when he used it, because I wanted to save it in my Project Life album. It's so neat! 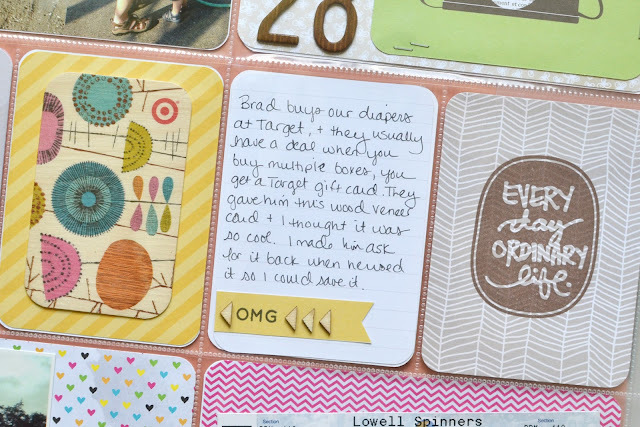 I used one of my stamps to put "OMG" on the little banner on the journaling card, and then some Studio Calico wood shapes to make arrows that pointed to the Target card. 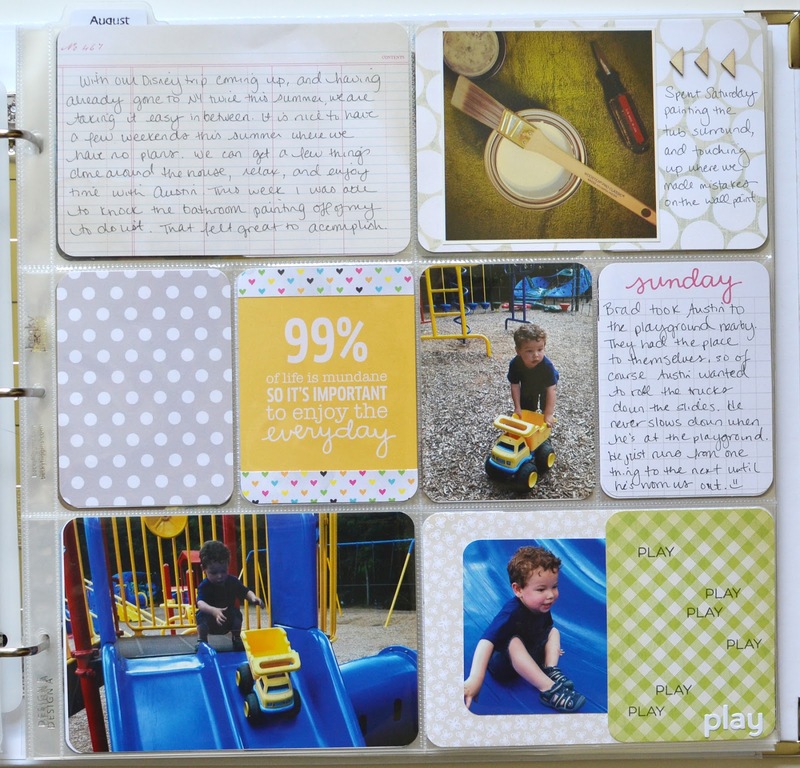 Also on this page I used an Ali Edwards Hello Routine stamp to make a little filler card for one of the slots. On this page I have a few photos of Austin at the playground. I'd made a little filler card a few weeks ago using a 3x4 card (from either the holiday mini or the seasons mini, I can't remember which one) and some stamps and alpha stickers. I added that on top of one of the photos which I used over another sheet of patterned paper from Amy Tangerine. 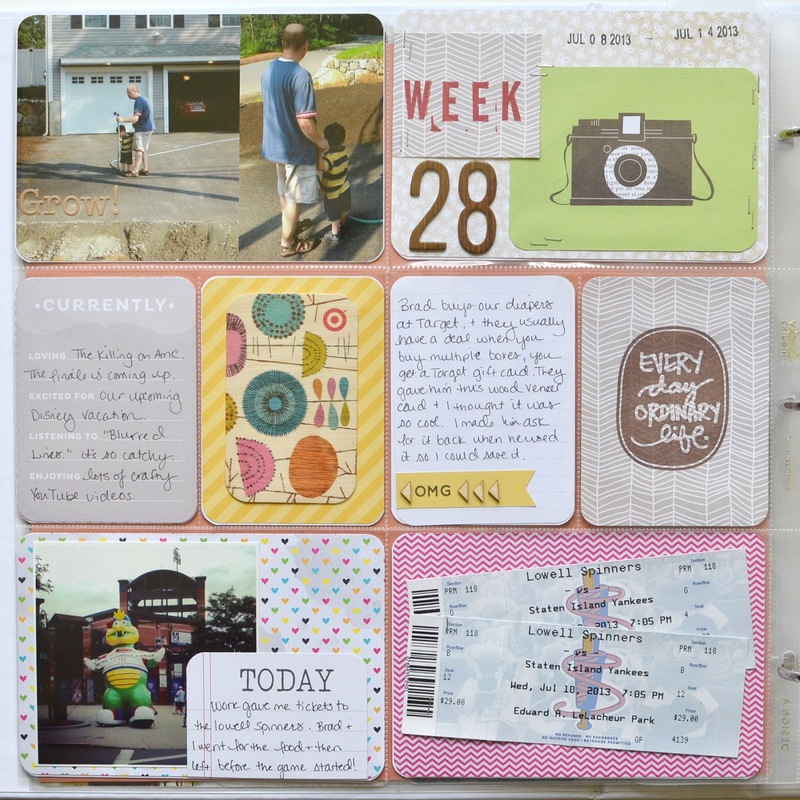 I used another sheet from that Amy Tangerine stack to make a 4x6 card to journal on about how we're taking it easy on the weekends lately because we have had several trips already this summer and have another coming up. Beside that, I have a photo I took when I was painting the bathtub on Saturday. I used more of the wood triangles (larger size this time) so that both pages in my layout tied together. Overall I really like how cheerful this layout was. 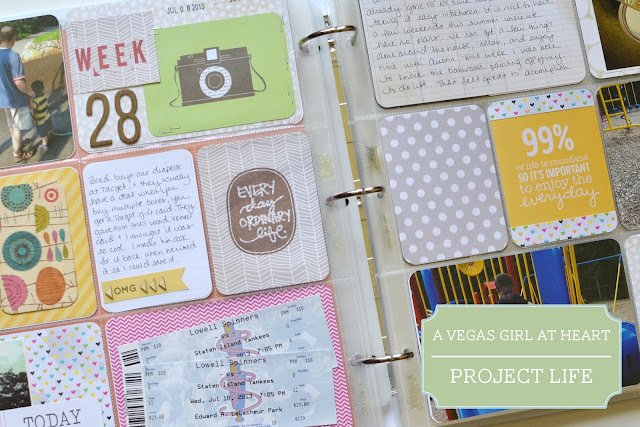 It was a bit of a challenge not only finding paper and journaling cards that worked with my photos, but documenting a full 2 page spread when I actually didn't even have that many photos to begin with. Thanks for checking out my layout today!